Offering relaxed yet professionally led motorcycle tours in Gran Canaria. Specialising in week long tours with a choice of accommodation options, ride some of the best mountain roads in Europe this year with award winning Canary Motorcycle Tours. You also have the option to build in the Island Hop added extra, riding over to Tenerife and Mount Teide. For those wanting an amazing adventure, we also offer an awesome 2 week, Grand Islands Motorcycle Tour, riding the 4 main Canary Islands with their different landscapes, scenery and roads. For those here on holiday and wanting an escape from the hustle and bustle of the resorts, we offer day ride outs. Take the hassle out of hiring a bike, let the professionals show you the best roads, routes, scenery and coffee stops. Cheaper than renting a bike - and no huge credit card deposit to pay, you have added benefits that come with a professional rider showing you around the best roads on the island. Our most popular tour, a one-week tour of Gran Canaria. 5 full days of riding. Rest day to explore the island on foot. With the fantastic climate we have here, this tour is suitable for all year round - ideal for winter riding. This is a truly outstanding tour that will give the rider a truly memorable experience. Whatever and whenever you want, for any length of time. Situated off the African coast, Gran Canaria has an ideal position in the Atlantic Ocean. With an area of 1,560 km2 and an altitude of 1,956 m, Gran Canaria is the third largest island of the archipelago in both area and altitude and enjoys spring-like temperatures all year round. Gran Canaria is a very mountainous island and rainfall is very rare in the summer months, an average of 21 days per year. With nearly 3000 hours of sunshine annually, this is one of the sunniest places in the world. The roads are mountainous with abrupt and spectacular landscapes. With only a few short motorways on the Island, Gran Canaria is a biker island heaven. No other European location can match the Canaries for reliable sunshine and the mountain passes and roads easily match and even excel roads in central Europe, the difference is you can ride here in the winter too – an ideal destination for winter motorcycle tours. Canary Motorcycle Tours was started 5 years ago by Martin Flynn and his partner Joy Allen. Martin, a Motorcycle Instructor with an established motorcycle training school in South Manchester, and Joy, an ex-civil servant of 20 years, decided to start the business after holidaying in Gran Canaria and realizing the awesome potential these roads have and how amazing motorcycling in Gran Canaria is. 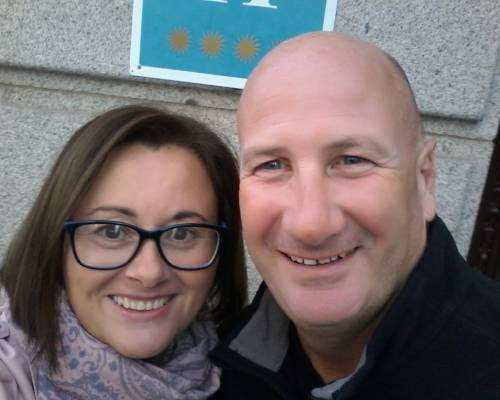 While there are traditional motorcycle hire companies on the Island Joy and Martin wanted to give friendly and flexible approach to touring while offering the best riding experience and by providing informal guided tours for you instead of you spending half the day map reading. After additional research, Joy and Martin realized the huge extent of the road network warranted a full weeks motorcycle tour, and Canary Motorcycle Tours began. With their knowledge of the Island, and Martin professional and extensive knowledge of motorcycles, you can be assured of a professional yet friendly week. The company is continually developing and going from strength to strength with many customers returning year after year. Canary Motorcycle Tours has received TripAdvisors Certificate of Excellence consistently for the last 3 years, in recognition for its excellent customer service and commitment to providing value for money. Martin and Joy love island life and believe they have a fantastic job, not only riding on this marvelous island, but meeting fellow riders while showing and sharing their own hairpin heaven. Gran Canaria is biking best kept secret.